What is there to do during Chinese New Year in Malaysia? Chinese New Year is perhaps the biggest and most important annual festival for Chinese and the Chinese communities world wide. The event is celebrated on the first day of the Chinese Lunar Calendar. Each year is named after one of the 12 animals of the Chinese Zodiac. Prior to celebrations, homes are cleaned and decorated by members of the family. Debts are also settled while offerings and prayers are made. Also, plenty of food is prepared and new clothes are purchased. Like any other event, family members from out of town and far away will come home for the gathering. 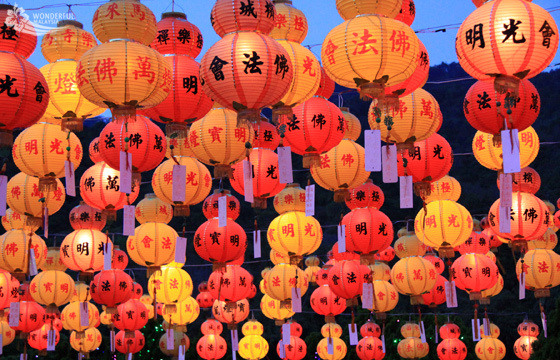 Also known by the name of Lunar New Year or the Spring Festival, the event is observed by the Chinese communities throughout the world, regardless of where they are. It is a cultural event and can a religious one too for the Buddhists, Confucians and Taoists who offer prayers. As the festival approaches, friends and relatives still exchange New Year greeting cards with each other despite the technology era. A family reunion dinner will be held on the eve of the New Year. During this time, bad language and any unpleasant or sensitive topic is strictly discouraged. It’s always best to be in one’s good behavior and only say good and auspicious things. On Chinese New Year day, everyone is abuzz with various activities, including decorating with duilian (a pair of scrolls with poetry written), giving red packets or angpau or ang pow containing money, visiting friends and families, having family meals and gatherings, playing cards with small bets of money and watching dragon or lion dances. While each country may celebrate the New Year in an almost similar way, the concept of open house is normally practiced in Malaysia where the homes are open for friends and family to visit, regardless of race and religion. The country’s leaders organize open houses too on a larger scale, often held at a community hall to accommodate the crowds of locals and foreign visitors who come to greet their leaders and tuck into festive goodies. Just like any other festival in Malaysia, Chinese New Year is basically the time of the year to get together with family and friends. 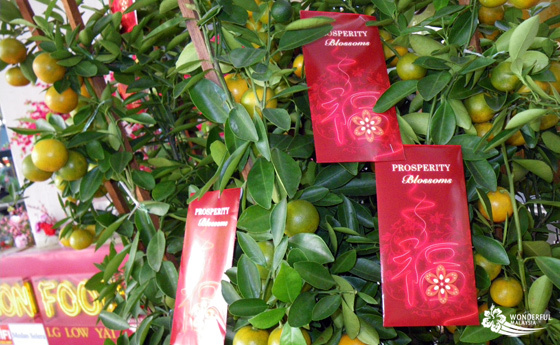 Chinese New Year is celebrated for fifteen days with the main focus on the first three days. Chap Goh Mei, or the fifteenth day of Chinese New Year, is once again celebrated with much enthusiasm. Homes are again decked in brightly decorated lights and legend has it that young and unmarried women could throw tangerines into the sea if they wish to get a good husband. This tradition has undergone a modern twist where the females still toss Mandarin oranges into the sea but now they have written their telephone numbers on them. Men in boats will then row over and fish out the oranges! The singles carry out this practice good-naturedly and have fun with their friends on that final night of the New Year celebrations. Once Chap Goh Mei has passed, daily life resumes with each hoping to have a prosperous year ahead. In Malaysia many people light fireworks during Chinese New Year. At Chinese New Years Eve, you can enjoy fireworks until the deepest hours of the night. Also at other days, people will light fireworks. The best chance to witness this is in the more Chinese areas in Kuala Lumpur (like Chinatown, Old Klang Road/Kuchai Lama and many areas in Petaling Jaya) and also in cities like Georgetown (at Penang Island), Ipoh and Malacca. 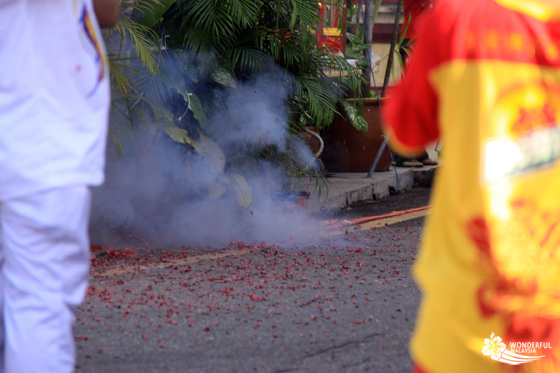 Hokkien Chinese in Malaysia also light a lot a fireworks at the ninth day of Chinese New Year, in celebration of the birthday of the Jade Emperor. 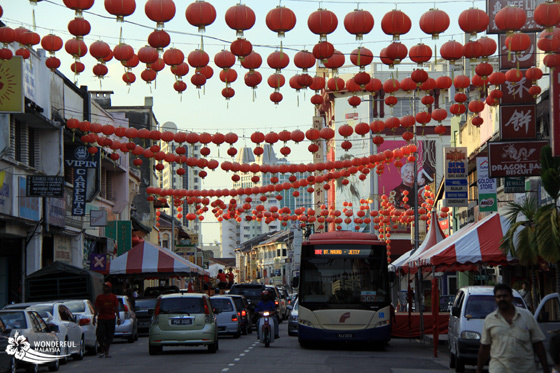 When you are staying in Kuala Lumpur during Chinese New Year you should definitely visit the Petaling Street area in Chinatown. 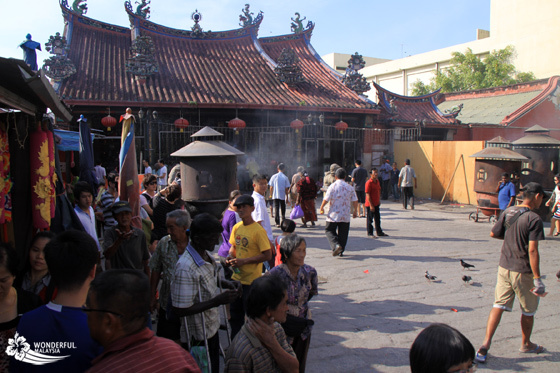 Here the Chinese temples are crowded with locals that come there to pray. You can witness lion dances and people lighting fireworks. 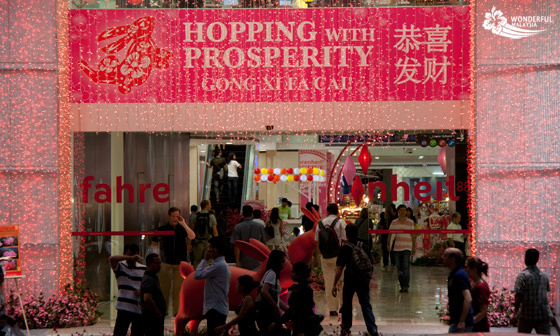 All shopping malls in the city showcase their Chinese New Years theme. 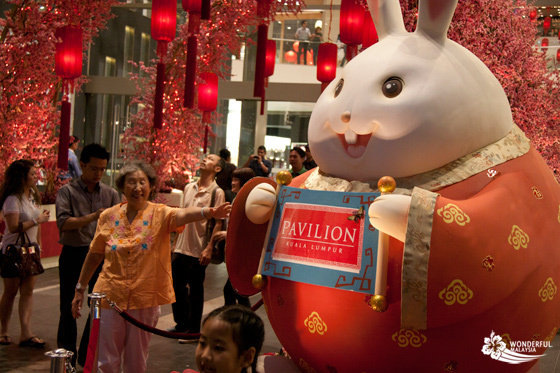 They are all decorated and during the first few days you will be able to witness lion dances within the stores. This is done to make sure the store is blessed and that business will be great that year. The first days of Chinese New Year are the only days of the year that you will witness many stores closed, as most of the Chinese business owners are visiting their relatives in their home towns or home countries. 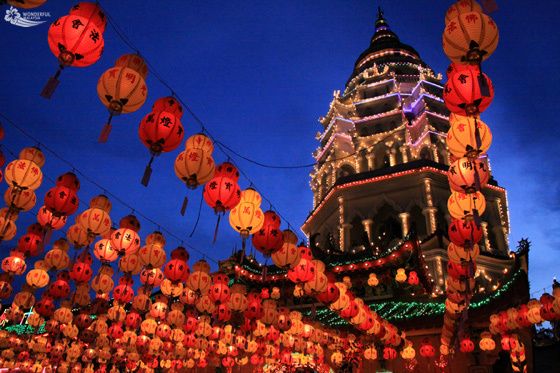 Especially Penang is a great place to visit during Chinese New Year. There are many beautiful temples in Georgetown, and all are crowded with Chinese Malaysians that come there to pray (mostly for health and prosperity during the new year). One of the most important temples at Penang Island, Kek Lok Si Temple, is especially interesting to visit. At night millions of colorful lamps transform the whole area in a beautiful scene. Locals come every night to witness the lights being turned on, it is a wonderful sight. 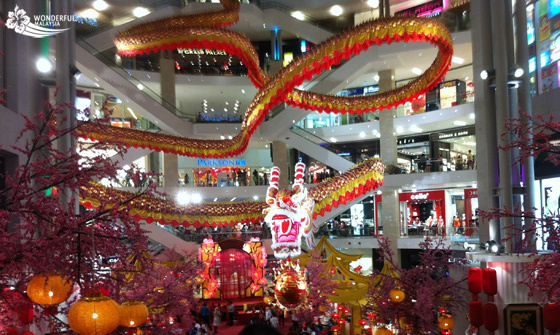 We find traveling through Malaysia during Chinese New Year very rewarding. We visited KL, Cameron Highlands, Penang, Kuching and Malacca once within the 15 days of CNY and we loved it. The atmosphere is very pleasant during these days. We loved all the fireworks and the amazing vibe at all the temples. Tourists that visit Malaysia during CNY should not pass up a chance to experience it up and close. Penang was by far the best place to be, especially the Chulia Street area was very nice. It is especially nice if you get invited to have dinner at a local Chinese Malaysian family. Families usually invite friends (or even strangers) over for dinner on the 2nd or 3rd day of Chinese New Year as the first day is always reserved for close family. Extremely fun to witness and eat is Yee Sang; a special dish that is only served during Chinese New Year. 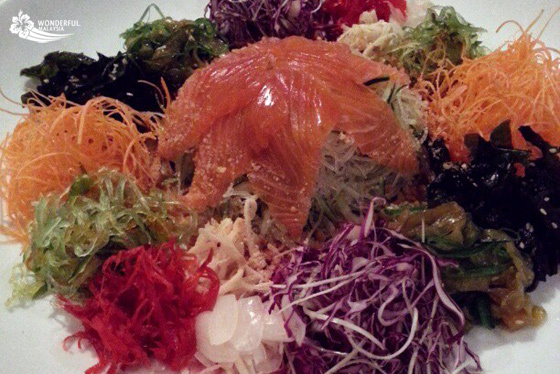 Yee Sang contains many different vegetables together with other ingredients. Once ready people will toss the shredded bits into the air by only using their chop sticks. It is very important that it is all tossed really high into the air as it reflects the amount of good luck, health and prosperity they will receive. Traveling during CNY can be quite exhausting, especially in the few days before the actual celebrations. Many people are traveling at the same time, often heading back to their home villages. Some use the public holiday to do some traveling their selves. Busses to Penang, Malacca or Ipoh will be packed, the same goes for flights to Penang. Traffic jams are common the days before CNY, but once it is CNY streets and highways are empty. Shops are closed during these days and people are celebrating at home or visiting temples. Got any good tips to share with us? 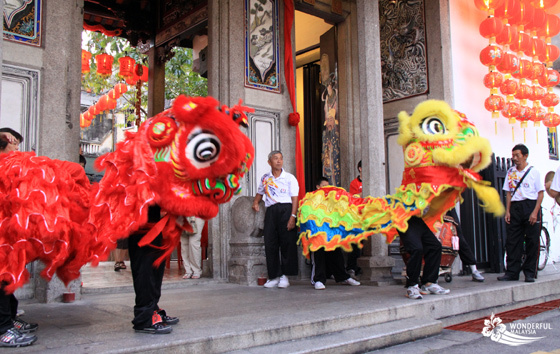 Do you know of any great things to do during Chinese New Year in Malaysia? Let us know by leaving a reply below! I’m in Kuala Lumpur now! I’m a bit outside the center, which day do you think would be best to visit Petaling Street? 3rd day or forth day shd b ok. The shops mostly open. hi. i would be pleased if someone tell me when can i find the events schedule for Chinese new year celebrations. Well one good read. Learnt a lot.